To see more of this inspiring space, be sure to watch the video. Welcome to the "cloffice" of Kelly Lee, a.k.a. Kelly Golightly. What's a "cloffice" you ask? 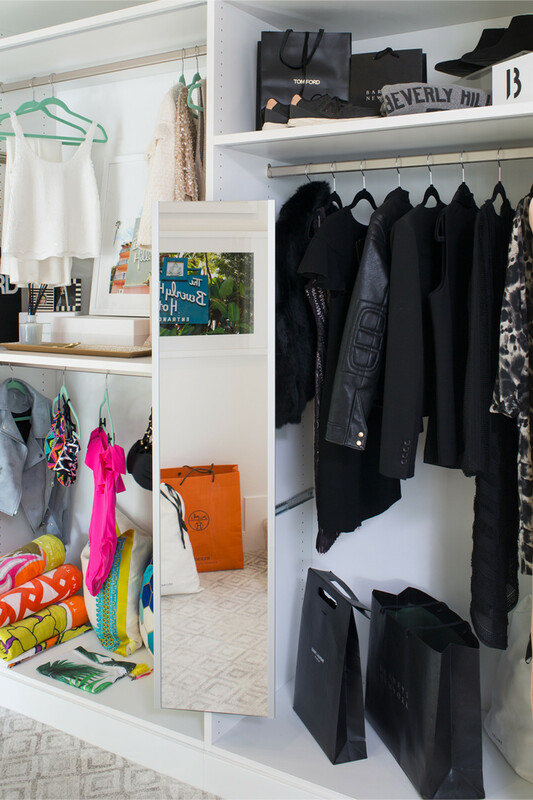 It's what happens when you combine a master closet with an office space for a fashion and lifestyle blogger. And as someone who teaches modern women how to channel the 1960's glamour Audrey Hepburn was known for, it should come as no surprise that it was Kelly who gave the space its fun moniker. This stunning space is one of the rooms in the Christopher Kennedy Compound - Modernism Showhouse 2017. To get the look (and amazing organization) Kelly needed to write her blog, he knew our gorgeous, custom Laren closet in Pure White was a must. He then brought in LA interior designer, Natasha Minasian, to pull everything together. 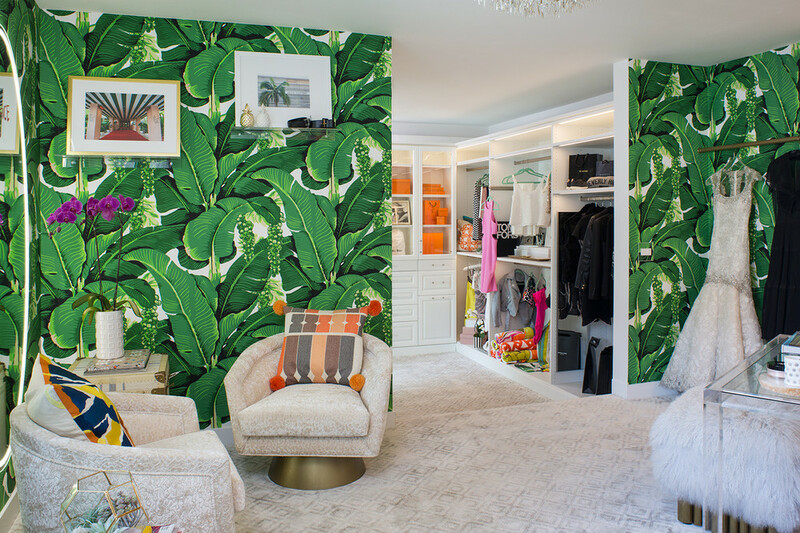 "I knew Kelly loved this Brazilliance wallpaper, so I took that inspiration and looked at what Kelley was all about - the modern glamour and ode to Audrey Hepburn and the Beverley Hills Hotel - and brought it all together," said Natasha. Every inch of the space is designed to showcase her amazing couture. Natasha did something unique when she designed the closet. She used our Glass Doors to enclose shelving with integrated lighting to create unforgettable display space for shoes, purses and artwork. Smooth Glass Pulls added the perfect touch of mid-century modern glamour to the doors and drawers. Extendable Valet Rods make it easy for Kelly to pull together complete outfits, either for a story or for the next day's outing. Integrated lighting puts the spotlight on her style. Surrounded by all her favorite things, Kelly says she adores her new space. "I never want to leave!" And behind all the glitz and glamour is a truly functional space. A hidden, Pull-Out Mirror takes up virtually no room while making it easy for Kelly to see her look from head to toe. 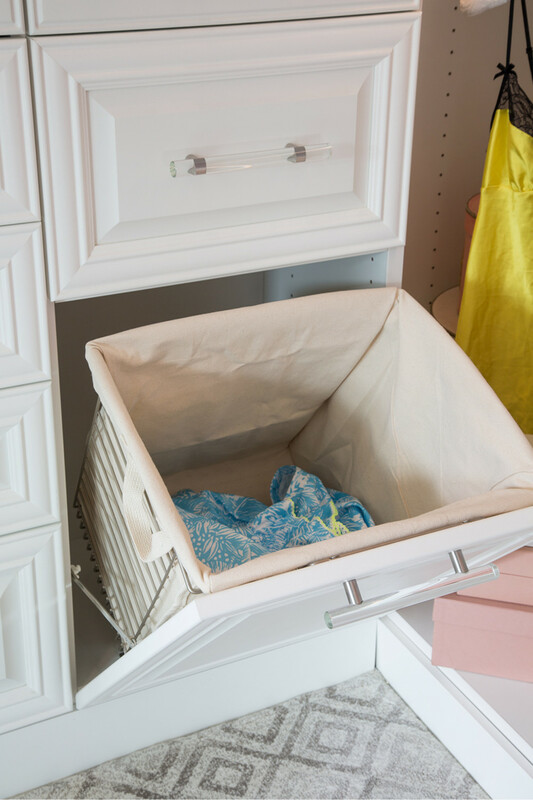 A concealed Hamper with Cotton Liner means she never has to air her dirty laundry. One of Kelly's favorite features are the four style vignettes created within large lighted cabinets. Kelly uses them almost like inspirational shadowboxes. Each cabinet holds an outfit or type of clothing like swimsuits and lingerie, accessories, photos and brightly patterned pillows. Inspiring. Organized. And totally gorgeous. 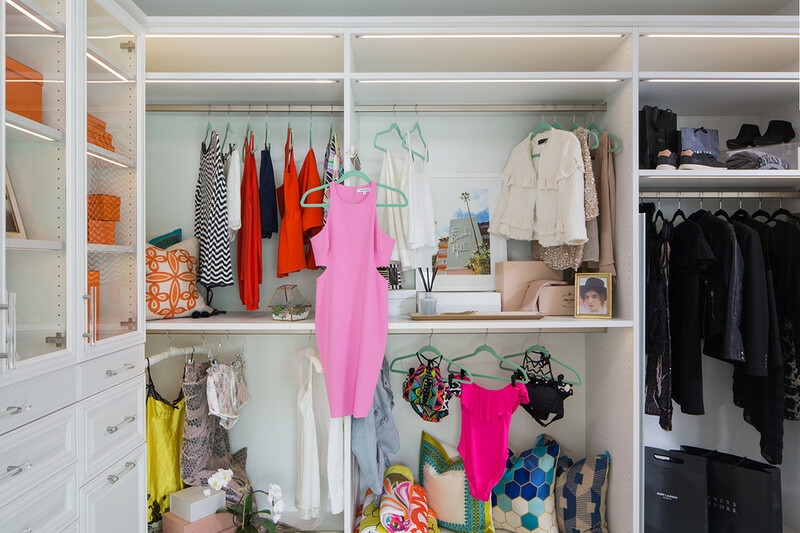 Kelly's "cloffice" has it all, allowing her to always keep calm and "Golightly!"